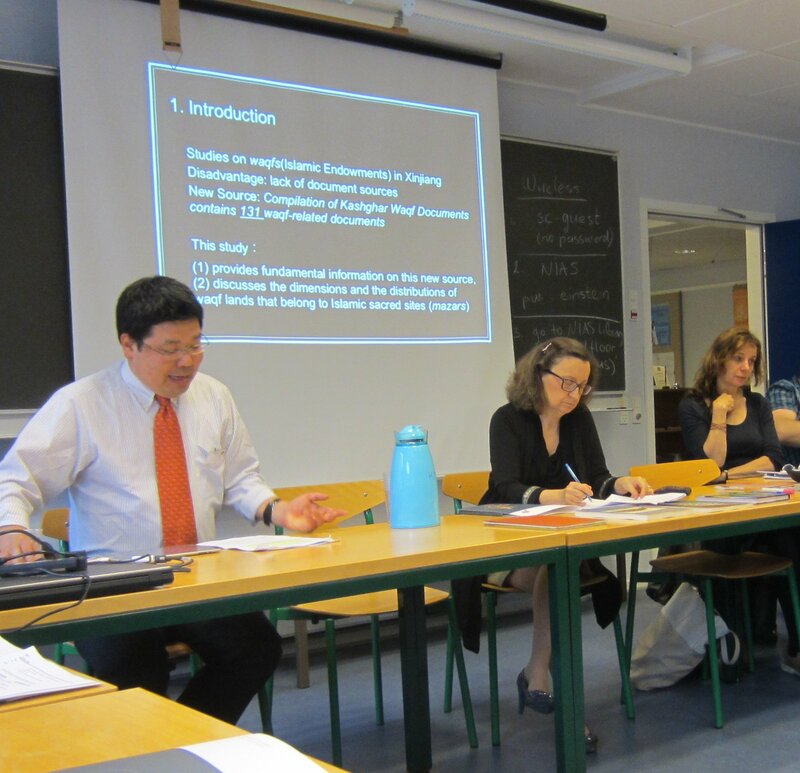 During the past 15 years Central Asian Studies at Stockholm University has devoted much of its research to various aspects of state- and nation-building in Central Asia and other neighboring Turkic societies in the post-Soviet era. 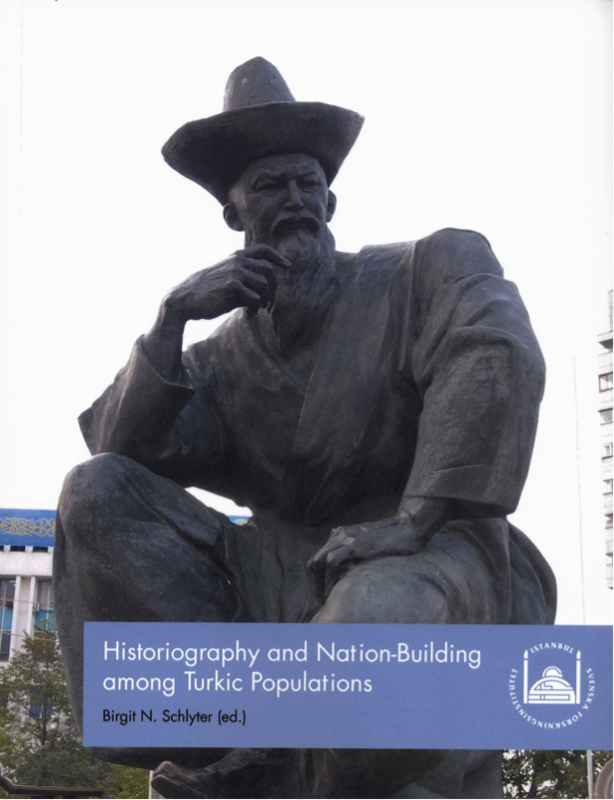 Two anthologies resulting from this research and published by the Swedish Research Institute in Istanbul are Historiography and Nation-Building among Turkic Populations (2014) and Prospects for Democracy in Central Asia (2005). Their contents are listed at the end of this post. Great changes have occurred in the Central Eurasian space with regard to the political and cultural processes focused on in these two volumes. At SIPCATS/Istanbul, new readings are currently being conducted for a reevaluation of issues presented in the different chapters. This could be a good opportunity for a still broader discussion with the participation of other researchers as well, including the contributors to the abovementioned anthologies. For the next few months, till the end of this summer (2016), a forum for discussion will be running on the SIPCATS Director’s Blog under the title of ”The Central Eurasia Discourse”. Within the framework of the SIPCATS Program and in accordance with several other international research programs, the designation of Central Eurasia refers to a geographically and cultural-historically cohesive sphere for studies in the humanities and social sciences. Common cultural historical features uniting a vast part of the Inner Asian area are, among others, not only the distribution of languages (Turkic, Iranian, and in modern times Slavic languages), but also epic literature spreading from Tibet and Mongolia in the east to Anatolia and eastern Europe in the west. As to origin this type of literature is largely nomadic in both content and ethics and has become part of folk literatures and national literatures influencing the language habits of individuals and societies. From a present-day sociopolitical point of view it may become more and more relevant to view the same area as an expanding Central Eurasian sphere defined first and foremost by economic networks and infrastructures sustained by surrounding – and partly overlapping – strong or influential powers, such as Russia, China, India, Turkey, and the European Union. A large part of the world trade is carried out by countries along the ancient Silk Road; according to some reports the share is as high as 25%. Against this background, I want to suggest the following broad themes as a general framework for future discussions and I look forward to receiving reflections and comments from both members of the SIPCATS Program and other fellow researchers. Please send in your contributions and comments to sipcats.webmaster@srii.se, which address can also be used for whatever questions you might have in connection with this forum. The Tajik Experience of a Multiparty System – Exception or Norm? A new anthology for Uyghur Studies is in the making and will be published by Brill later this year. With contributions from scholars in the fields of language, history, religion, kinship and gender, this volume in memory of the distinguished Swedish Turkologist, Ambassador Gunnar Jarring (1907–2002), is likely to become an important reference work for future research. One of the anonymous reviewers characterized the edited manuscript as “something of a showcase of the various dimensions of ‘Uyghur studies’ as practiced today”. The title of the book is Kashgar Revisited: Uyghur Studies in Memory of Ambassador Gunnar Jarring and the editors are Ildikó Bellér-Hann, Birgit N. Schlyter and Jun Sugawara. Besides his well-known career as a Swedish diplomat, Gunnar Jarring also excelled as a scholar. Through his voluminous publications he made a significant contribution to Turkic Studies. His work has been fundamental to the emergence of Uyghur and Xinjiang Studies. The aim of this volume is twofold. With contributions on a wide range of topics, we wish to pay tribute to Gunnar Jarring’s scholarly accomplishments while at the same time providing an overview of recent and ongoing research on the Uyghurs and Xinjiang. The three editors at the symposium (Copenhagen, 2012) preceding the aforementioned anthology. In 2007, the 100th anniversary of the birth of Gunnar Jarring was celebrated at different places in Sweden. The following text is an excerpt from my own speech delivered on this occasion at the Royal Swedish Academy of Letters, History and Antiquities. The one who truly heeded this piece of advice, perhaps more than anybody else, was Gunnar Jarring himself. When he retired from the Swedish Foreign Ministry, Jarring returned to the Uighurs and their language. In fact, he had never really left them. However, after his retirement as an Ambassador in 1973, he could once more devote more of his time and energy to them – as he had done before he became a diplomat, as a student of Turkology. Besides his scholarly work on Uighur lexicography, folk literature and ethnology, Gunnar Jarring took a keen interest in the Central Asian region as a whole, from a linguistic and literary point of view as well as an historical and political one. A large part of his vast library consisted of publications on Central Asia, both from the region itself and from other parts of the world, not least the former Soviet Union, where Jarring was Ambassador from 1964 to 1973. His collection of Central Asia publications belongs to the Swedish Royal Academy of Letters, History and Antiquities, which had Ambassador Jarring among its fellows. 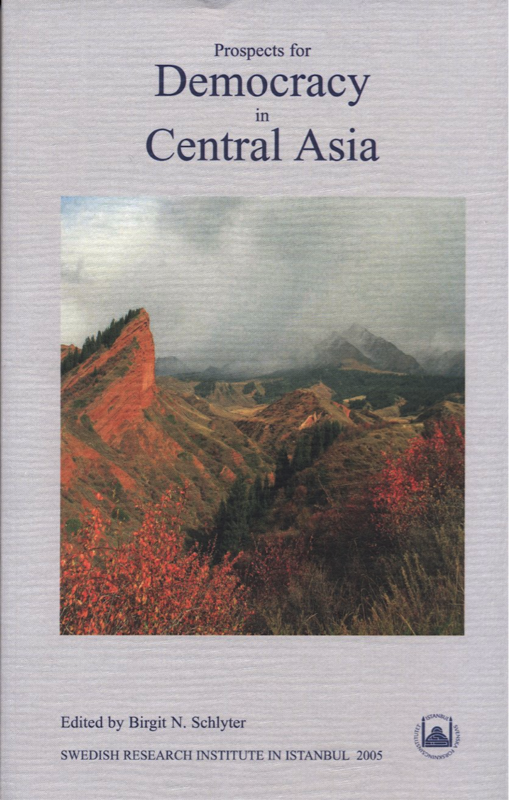 All of the most renowned accounts of expeditions to Central Asia and adjoining regions from the late 19th and early 20th centuries can be found in this collection, along with a great number of lesser known accounts, some of which are very rare and accessible at just a few or perhaps no other libraries in the world. Together these publications thus provide us with an exceptionally rich material for studies of the accumulation and formation of Western knowledge about Asia in general and Central Asia in particular during the colonial era up until the cold war era. Linguistic treatises and dictionaries for many Central Asian languages are also to be found in the collection, as well as books on history, religion, literature and several other disciplines. All in all, the collection consists of almost 5000 volumes, a number of manuscripts, catalogues and maps as well as more than 3000 offprints, most of which were signed by their authors with dedication inscriptions to their colleague and friend, Ambassador or Professor Jarring. 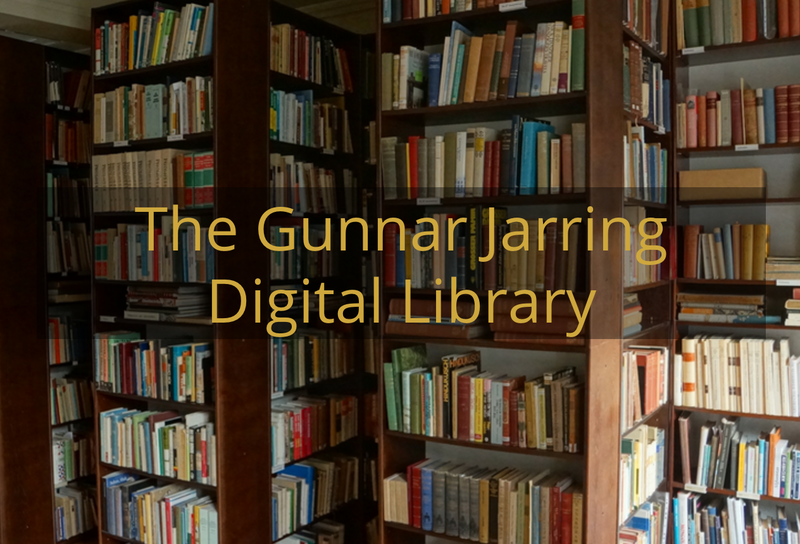 A few years before Jarring passed away, this collection was at his own request deposited at the University of Stockholm, where it was catalogued and came to comprise the core of a future “Gunnar Jarring Library”. Ambassador Jarring’s last contribution to his own collection of Central Asia publications was a handwritten manuscript for the second edition of An Eastern Turki-English Dialect Dictionary. Ever since the first edition was published in 1964, Jarring seems to have worked on a revised and substantially enlarged version of this dictionary. He was engaged in this enterprise up until his death at the age of 94. During the same period he published several minor works containing edited texts in literary Uighur and to a still greater extent in oral varieties of this language, together with translations, commentaries and glossaries. The last publication during his life-time appeared in 1997, on the 90th anniversary of his birth: Central Asian Turkic Place-Names – a dictionary of more than 500 pages compiled on the basis of the long series of reports from the Sven Hedin expeditions, Gunnar Jarring’s own transcriptions of Eastern Turki dialect material and many of the accounts of expeditions eastwards in Asia to be found in the aforementioned Jarring Collection of Central Asia Publications. All of these late publications by Gunnar Jarring were included in the extended list of sources referred to in his manuscript of the second, enlarged edition of the Eastern Turki dialect dictionary. With generous grants from The Academy of Letters, History and Antiquities and the Henrik Granholm Foundation at Stockholm University, Jarring’s manuscript has been edited for publication at the Department of Central Asian Studies in Stockholm. The author of the article, Major Montgomerie, presents a report of a journey from Kabul to Kashgar at the end of the 1860s – an expedition that for various reasons did not return until two years later. 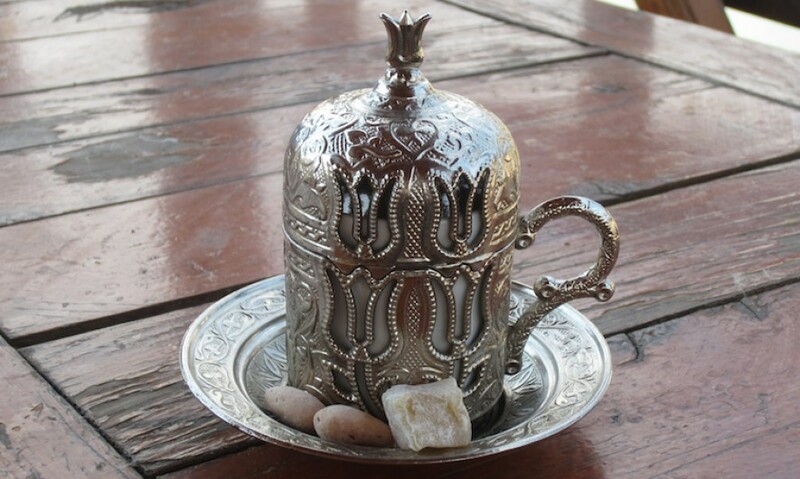 The traveller was not Montgomerie himself but a local silversmith, the “Mirza”, as he was called – trained as an “explorer” and sent off on his mission by the British in 1867. The “atalik” mentioned in this quotation was Yaqub Beg. He was the leader of an Islamic state in Eastern Turkestan for about 10 years, from 1866 to 1877 – a strict and demanding Islamic leader who put the Islamic law into force and who did not allow women to be unveiled outdoors. The word burka cannot be found as an entry in the first, 1964 edition of Jarring’s lexicon. Nor is there any entry for atalíq. Jaqob as a proper name is there as well as beg. However, there is no information about Yaqub Beg. The new extended edition, on the other hand, has them all – burka, ataliq and Yaqub Beg. We even find Yaqub Beg’s full title: atalíq gha:zí. In 1964 Jarring called his dictionary an “index” to his collection of Eastern Turki oral texts published in four volumes between 1948 and 1952 under the title of Materials to the Knowledge of Eastern Turki. A number of other texts were included as well. In the same preface he commented that it had been his intention to take into account all published Eastern Turki texts and to include the total word material of all these texts. However, lack of time had prevented him from doing so, he wrote, and for this reason he had decided to draw exclusively on his own material. There had, thus, been a desire to produce the ultimate exhaustive dictionary of Eastern Turki, or as he also commented in the 1964 preface, the Eastern Turki language up until the mid 1930s – the language of a non-modernized society – since the time he was working on the first version of his dictionary. This desire apparently never left him. During the last thirty years of his life he worked constantly on this project and produced hundreds and thousands of handwritten pages. Ambassador Jarring finished his manuscript and could have it all typed before he died. He also took an active part in the preparations for the transfer of the files and printouts to the Department of Central Asian Studies at Stockholm for the final editing and publishing of the manuscript. 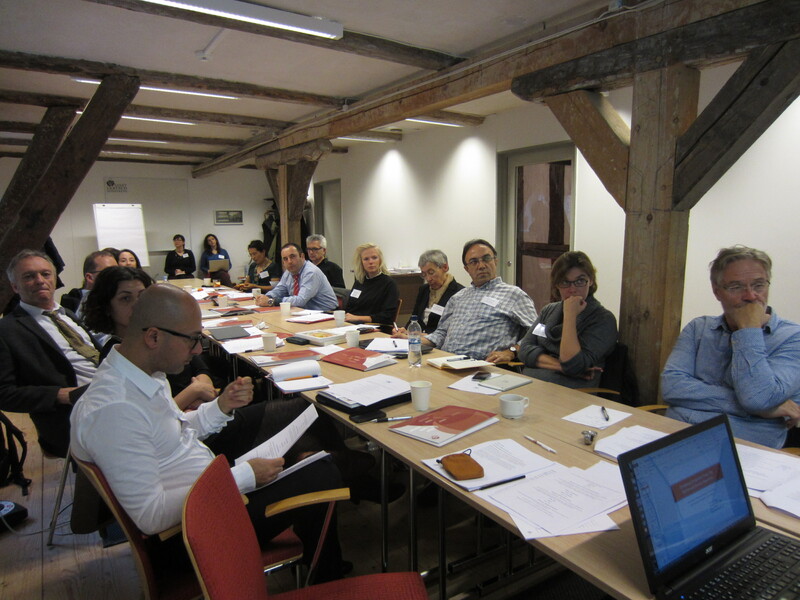 The general point of departure for activities within the framework of MICS has been to form, consolidate and sustain a network for Nordic and Eurasian scholars in the humanities and social sciences. The immediate aim of the abovementioned series of scholarly meetings was to organize international workshops on one or more of the four key issues of the MICS program – Migration, Identity, Communication and Security. These closely intertwined processes denote fundamental societal challenges which researchers and practitioners alike will need to confront continuously within the foreseeable future. The 2nd MICS workshop held at Malmö University in November, 2014. The workshops were organized in a comprehensive manner as regards both topics and participants. The total number of contributions was 47 papers delivered by scholars and students from 12 different countries (Albania, Denmark, Finland, Germany, Great Britain, India, Kazakhstan, Poland, Russia, Sweden, Turkey, and Uzbekistan) and 35 universities or research institutes. Besides senior and junior researchers there were participants representing other fields of sociopolitical and cultural work, such as journalists, photographers, artists et al. One of the follow-ups of previous MICS activities will be a forum for discussions under the title of “The Central Eurasia Discourse” on this blog, to which the participants from the MICS workshops as well as others will be invited. Information about this will follow shortly.